Here, in contrast, I can write whatever I want, no matter how inadequate my understanding might be. My blog posts are narratives of my own reading experience, and so I’m answerable only for being honest and thoughtful about that. I feel much the same. Most of my posts about books are musings or personal responses rather than reviews. 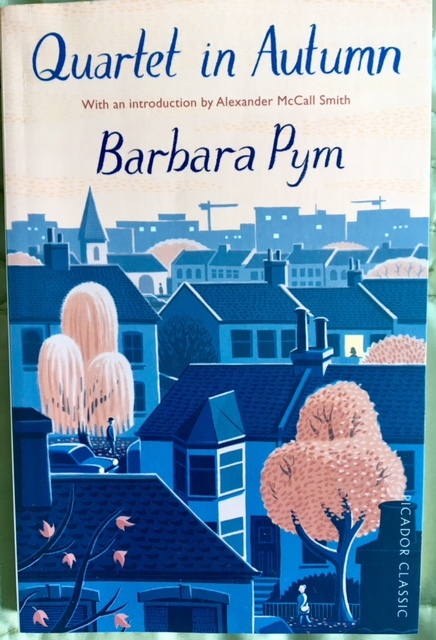 Of late, when I’ve been obliged to spend quite a bit of time in bed trying to recover from a recurring heavy cold/cough, I’ve got through quite a few books, so today’s post will be a quick response to Barbara Pym’s 1977 novel Quartet in Autumn (links to my previous posts on BP at the end of this piece). A thoughtful introduction at the sadly now defunct Open Letters Monthly (one of Ms Maitzen’s former haunts) by Michael Adams in 2011 is a good place to start if you’re new to Pym’s quietly stated but profoundly moving fiction; he cites admirers such as those who rediscovered her in the 70s when she’d become neglected and unpublished, Larkin and Lord David Cecil, then slightly later advocates like John Updike and Shirley Hazard. Quartet in Autumn, shortlisted for the Booker Prize when it was published in 1977, is one of Barbara Pym’s most unsentimental books, about four English office workers who face aging in different ways. Edwin, Letty, Marcia and Norman have little in common except that they have worked in the same office for many years. They are each eccentric and difficult in their own way, and resist connections with each other. Letty is a spinster who doesn’t know why life seems to have passed her by. Marcia is an anti-social eccentric, whose quirks and paranoia are becoming more pronounced since her mastectomy. Edwin is a widower obsessed with church-going. And Norman is a ‘strange little man’ with a sarcastic sense of humor and more than a touch of misanthropy. The link to the Society’s conference monograph papers includes several fascinating pieces on Quartet – and on her other novels and related topics. Well worth exploring. I’d recommend this essay by Tim Burnett on the social background to the novel: it very much reflects the dying world of shabby genteel gentlewomen about which Pym had previously written, but which by 1977 was changing rapidly – there are timely references to the welfare state, particularly the NHS (Marcia’s mastectomy – an operation that Pym herself underwent, would have been free at the point of service, the basic principle of Britain’s health service – but then, as even more so now, under severe financial strain), immigration (some slightly uncomplimentary references to a Nigerian landlord, racist anti-Asian graffiti, etc.) and other signs that the post-war world in which she’d grown up was transforming out of recognition. Even the ‘churchy’ elements that dominated her previous novels is much reduced; only Edwin, with his mania for attending obscure saints’ day ceremonies at a range of his favourite churches, and tendency to look up new priests’ details in Crockford’s directory in the public library (another aspect of the welfare state that’s so prominent in the novel), maintains that tradition. Burnett also considers the theme of nutrition in this novel: Marcia hoards tinned food (among other things – milk bottles, plastic bags), and we are often told what the office quartet are having for lunch or supper – usually as an index of their social status and mental state (Marcia slips quietly into a kind of anorexia, subsisting largely on tea and the occasional biscuit). The other Pym Society essay I found informative is this one by Raina Lipsitz on the characters’ varying degrees of ‘failure to connect’. Poor Letty, for example, perhaps the most sympathetically portrayed, and who we see most of, is shown resisting the overtures of a fellow diner at the cheap restaurant she lunches at – yet there’s a part of her that yearns for the human contact she instinctively, paradoxically, shies away from. Of the four only Letty used the library for her own pleasure and possible edification. She had always been an unashamed reader of novels, but if she hoped to find one which reflected her own sort of life she had come to realize that the position of an unmarried, unattached, ageing woman is of no interest whatever to the writer of modern fiction. This is a deeply felt, poignant novel about that process of nearing and reaching retirement age in a world where you’re not noticed; when Marcia and Letty are given a low-key retirement send-off at their office, it’s done at lunchtime to keep the costs down, and no one in charge is clear exactly what any of these four colleagues actually do. They won’t be replaced – for they have no value to the organisation (which significantly is never identified, neither is the work they do: filing and clerical, it’s hinted, but they don’t often seem to do much work) – or, by implication, to society. Pym’s is the voice of the vulnerable, marginalised, atrophied remnants of a bygone, dying era. As with Willie Loman, attention should be paid to them, no matter how unattractive or superficially flawed or redundant they seem. This entry was posted in English Literature and tagged Barbara Pym, Booker Prize, Quartet in Autumn, Rohan Maitzen by Simon Lavery. Bookmark the permalink. Simon, sorry to hear your ailment is recurring. Please take excellent care, there are some horribly persistent bugs out there! (Won’t generally post publicly on this, but made exception!) Now on to Barbara Pym. Hurrah! Excellent post Simon (and I do hope the cold finally goes away…) I fell of the Pym bandwagon after an attempt at reading one of her books a month for a year. I appreciate her qualities and strengths, but that was just too much too close together. So I never got to this one, but I will one day – as you say, she chroniicles the lives of the marginalised so well. I know what you mean about bingeing on BP – best to visit her sporadically. But very rewarding if you can tune in to her; there’s a toughness beneath the surface whimsy- more so in this one than all the others I’ve read. Marcia is abrasive and damaged, Norman is bitchy and bitter. The patronising social worker is given a hard time, too. Loneliness is a difficult theme to get away with, but she just about does. An author I go back to regularly, like Brookner, Fitzgerald, Taylor, especially when I’m very depressed. They are my soul sisters (a pity I don’t share their talent though). I had planned to read this one in April, for the 1977 book club. “To binge-read or not to binge-read”, that would be a good subject for Simon and Rachel’s podcast ! It’s uplifting to read Rohan’s struggles with ‘reviews’ and ‘posts’, Simon. It’s good to know that it’s not just me, writing without the weight of academia behind me, who feels uncomfortable with the notion of writing a review. I’ve been starting to think of myself as writing about my ‘experience’ of a book: and my experience is almost certainly not going to be the experience of anyone else, so they would be well advised not to take my thoughts as a review! But to Pym. I have vague thoughts of reading this later in the year. It may depend on how bouyant I’m feeling. Not sure I’ll read it if I’m likely to wallow in its mood! Your description of the book (ha – avoiding that ‘review’ word now!) made me think of Anita Brookner’s novels. I read a number of them over a relatively short period some years ago. I came across one very recently and wondered at what had drawn me to them at the time; I certainly wouldn’t choose to read them now. Excellent ‘review’ as always. And I do hope you’re up and about and properly recovered very soon. Spring really is almost with us, I hope! Great post/thought/whatever you want to call it! This sounds like an interesting corner of Pym’s writing – one I have, but haven’t managed to get to for the 1977 Club.